Today has left me feeling overwhelmed—not just with the Spirit, which has been spilling over in me every day, but with new information and insights about this place and its people, both ancient and modern. In the spirit of this blog as my place for pondering rather than reporting, I will not try to recount everything I saw and learned today. Instead, I’ll focus on a few questions and ideas that I want to process more deeply. I will throw in a few extra pictures to share more of our day. 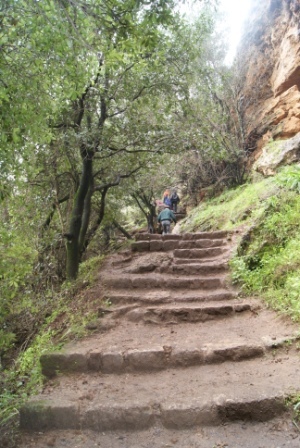 The long and winding path down to the waterfall. You can only see about half of the steps in the photo. Our focus scripture for the day came from Mark 8:27-30. 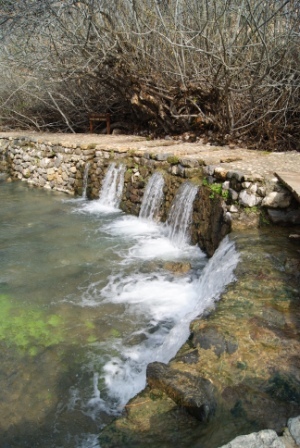 Jesus and his disciples had ventured into the territory of Caesarea Philippi, which is the same territory we ventured into for the day. In that region, Jesus turns to the disciples and asks them: “Who do you say that I am?” Peter responds with the first confession of Jesus as Messiah: “You are the Christ.” We were invited to ponder: Who is Jesus? Who do you say that Jesus is, to you and for you and in your ministry? 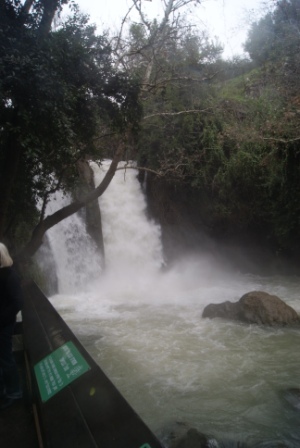 Waters headed into the Jordan River at Banias, the town known as Caesarea Philippi in Jesus' day. 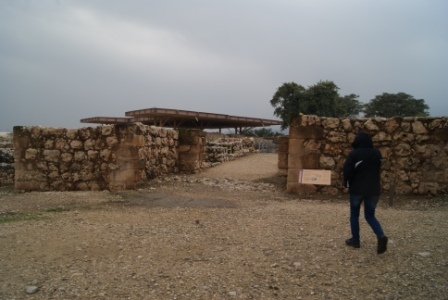 That question took on new meaning when we laid eyes on the ruins of Caesarea Philippi, which housed more than 20 temples to Roman gods. 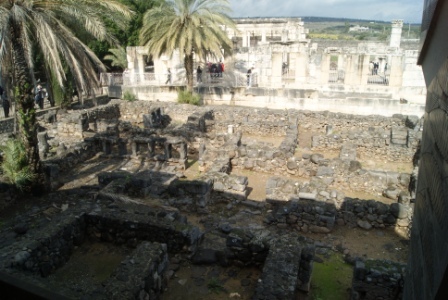 Many of the ruins we saw were built in the decades after Jesus, but the spirit of the first century city came clear. Palestine in the Roman era was not a monotheistic culture, and Caesarea Philippi was an amalgam of Roman, Hellenistic and Jewish worship. 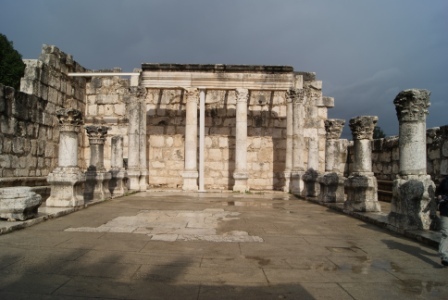 When Jesus posed the question to his disciples, it was not a question about where he stood in relationship to the One True God, or about how his ministry related to Temple Judaism. That question from Jesus invited the disciples to contemplate how his teaching and his path might be unique among all the multitude of competing cults in their world. With all this diverse religious worship, where did Jesus fit in? 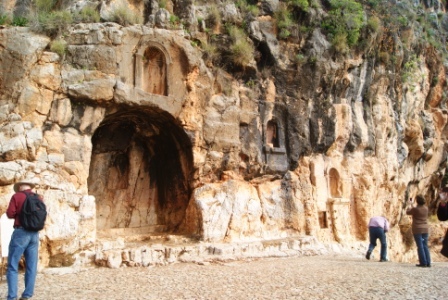 The grottoes are all that remain of the Greco-Roman temples at Caesarea Philippi. Was Jesus asking for a grotto like these? Clearly not. Rather than contemplate the answer to the question, I have been more interested in the source of the question. Why did Jesus ask the question in the first place? Was he setting them up for a test of faith? I doubt it. Was he in need of an ego boost, someone to tell him he was great and his ministry was important? I doubt that even more. Was he taking the temperature of his followers, to assess their level of understanding and commitment? Maybe a little bit, but probably that wasn’t all. 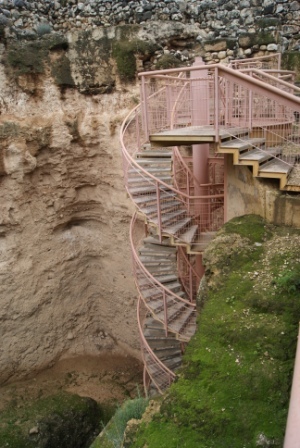 The grottoes of Caesarea Philippi. The large cave once stood behind the Roman Temple of Pan. All of us, from time to time, ask our friends and family and even strangers to tell us who they think we are. We all do it, but why? We have an image about ourselves, who we are and what matters most to us and how we present ourselves. Yet we wonder if the world sees us the same way that we see ourselves. We need those around us to reflect back to us what they see, to correct our misperceptions, our blind spots, our sins. Honest feedback is the source of truth about our identity, not just as we perceive ourselves but as the world perceives us. 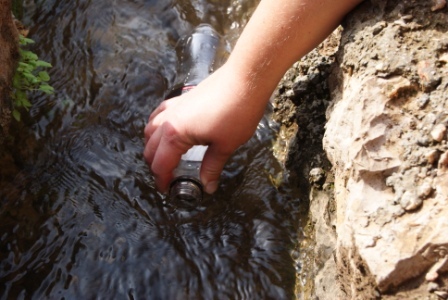 Collecting water from the source of the Jordan River, to bring back home for baptisms. I did it myself this afternoon. I didn’t connect it to Jesus’ question until I started this writing, but the two belong together. My roommate is a licensed marriage and family therapist as well as a pastor, and this afternoon during a break we started talking about the Enneagram. She uses it frequently in her work, and we began together to figure out my type. She made a guess, and I probed her with questions about what that type said about who I am. Because I was resisting her characterization, she produced an application on her Ipad to let me take the official test. In the end, the test proved her right, and I spent the rest of the afternoon peppering her with questions about what that type said about who I am. 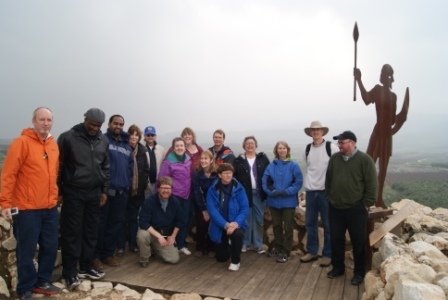 Our group atop Tel Hazor, the site of an ancient Canaanite city and a city of Solomon's kingdom. Who do you say that I am? I asked over and over again, in different ways and with various nuances, to her and to the test. What did I want to know? I wanted to know if their perceptions matched up to my self-perceptions. 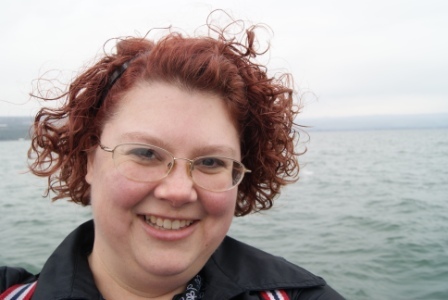 I wanted (especially from the Enneagram) to gain insights into my strengths and challenges. I wanted to hear affirmation of the deep longings of my heart. I wanted appreciation for how I think and how my heart moves. I wanted confirmation that the faults I wrestle with are indeed the faults I need to wrestle with. I wanted to be seen and known rightly. Perhaps that is all that Jesus longed for as well—to be seen and known aright. 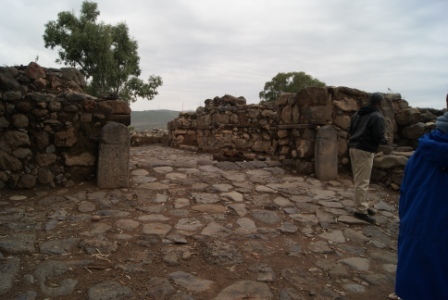 The remains of the city gate at Hazor, "Solomon's Gate," where all who entered the city were required to state who they were and why they were there. According to scripture, Peter is the only one who answers the question, and I always imagine his answer arriving in an outburst that surprises everyone, including himself: “You are the Christ!” It is a confessional moment, when he calls out the truth as he sees it. As with all true confession, it startles everyone with its boldness, even as everyone who hears it knows its power. 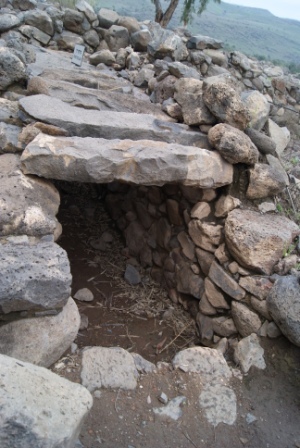 At Tel Hazor, the discovery of an ancient tunnel to get water from the source at a spring outside the city gates. 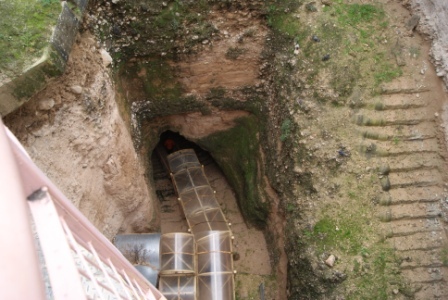 In times of siege, they went through the underground tunnel to collect water from the source. Constructed in the time of Ahab, approx. 900 years before Christ. We continued to process the question as a group tonight: who do you say that Jesus is? One member of the group responded like Peter, with a confessional outpouring: “Jesus Christ is my Lord and Savior!” He spoke with confidence and assurance. Others spoke with hesitation and doubt. Theirs too was a confession, an admission of their struggles to know who Jesus is in their lives. It was more like the confession of a father whose son received healing: “I believe, O Lord! Help my unbelief!” Many in our group spoke about how their understandings of Jesus had changed throughout their lives, with some ideas and identities taking on prominence as others receded or were even rejected. Things got a little tense, as Christologies tangled with one another, with doubters doubting and proclaimers proclaiming. We had to wind down and down to get to the source of the water underground. For me, right now, the confession comes easily. Not quite as easily as Peter’s, and I might meddle with the exact word choices, but I can confess my faith with joy. At other times in my life, doubt held greater sway, and I might not have been able to confess faith, only questions. Even though I can confess easily now, questions remain. 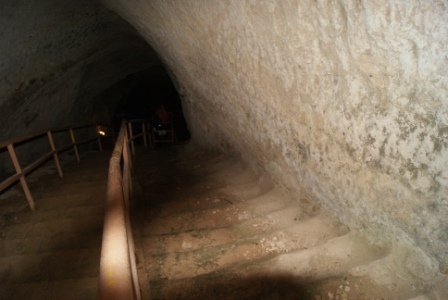 Entering the tunnel, with the modern steps paralleling the ancient ones. That I with body and soul, both in life and death, am not my own, but belong unto my faithful Savior Jesus Christ; who, with his precious blood, has fully satisfied for all my sins, and delivered me from all the power of the devil; and so preserves me that without the will of my heavenly Father, not a hair can fall from my head; yea, that all things must be subservient to my salvation, and therefore, by his Holy Spirit, He also assures me of eternal life, and makes me sincerely willing and ready, henceforth, to live unto him. Who Jesus is determines who we are. Confession—You are the Christ! My Lord and Savior!—is only the beginning. From that moment on, our answer to the question of who Jesus is becomes the answer to who we are. When we confess ourselves as followers of him, we vow to be “sincerely willing and ready, henceforth, to live unto him.” If Jesus is a teacher, we are learners and teachers ourselves. If Jesus is a friend, we are friends to others. If Jesus is an advocate for social justice, we too are builders of peace and justice for all. If Jesus is a healer, we are healed and healers too. The source of our identity is found in Jesus. At last, at the bottom of the dark tunnel, the water source. Praise be to God, for questions and confessions, for doubts and decisions, for tensions and resolutions, for growth and change, for the source of our life and who we are. 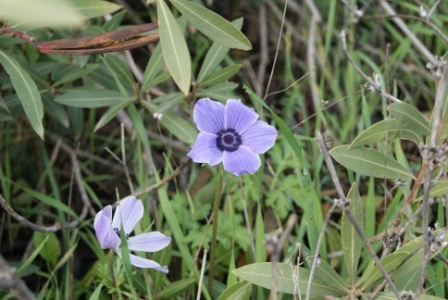 A flower on the mountain over Banias Waterfall, in the Golan Heights. Today’s excursions had a spirit of exploration and adventure. 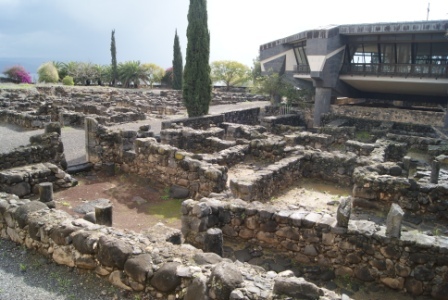 We first visited the archeological site at Bethsaida, followed by a boat ride on the Sea of Galilee and visit to a museum housing a first-century boat. 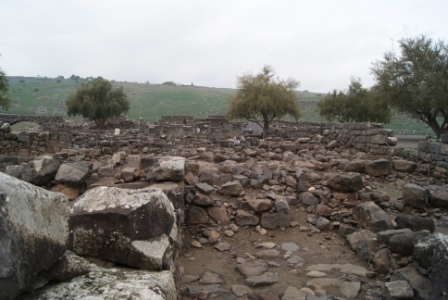 Bethsaida sits atop an ancient tell (human-made mound), and was a fortified city back to the time of the Hebrew Bible. 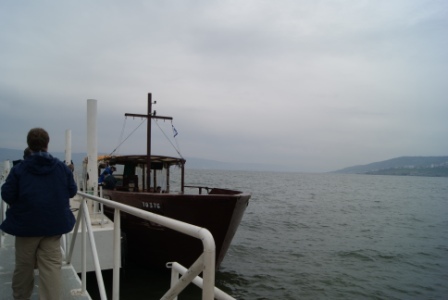 It held a strategic location where the Jordan River empties into the Sea of Galilee, although the Sea has since receded 1.5 kilometers from Bethsaida’s hilltop. Bethsaida translates as “House of Fishermen,” and it completed our tour of the towns in the Galilee where most of Jesus’ ministry took place. “House of Fisherman” proved an accurate name, since they uncovered a home or compound that showed evidence of all sorts of fishing implements. We could walk through what was once the courtyard (where fish were cleaned and processed), kitchen and residences. There was also a winegrower’s house, complete with a wine cellar originally full of wine jars and pruning hooks. Ruins of the Fisherman's House. Front room is courtyard, behind that is residence. Where the people are is the kitchen. 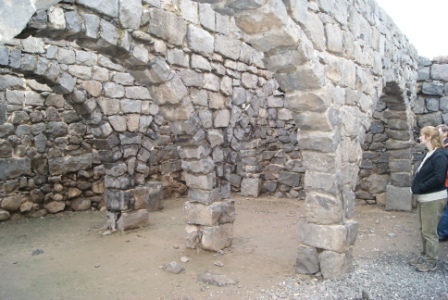 The most fascinating part of the ruins, however, was the ancient city gate, which was only unearthed in the last year. Only town residents were allowed inside the gate, but the area immediately outside was the spot for all public meeting. We saw where the market would have been held, trades would have been negotiated, and judgments rendered in crimes and civil disputes. Atop the gate itself was a memorial to a Roman cult, and an image of an armed bull sent the message that the town was strong and protected. 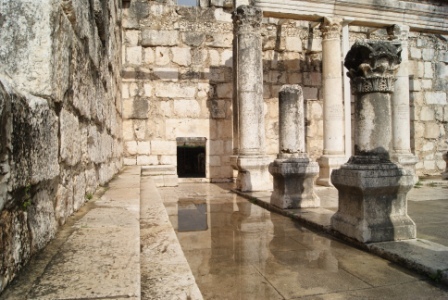 In Jesus’ day, the Via Maris (the major road to Damascus) would have passed by the city gates, and there was a stone manger with water for animals outside the gates. 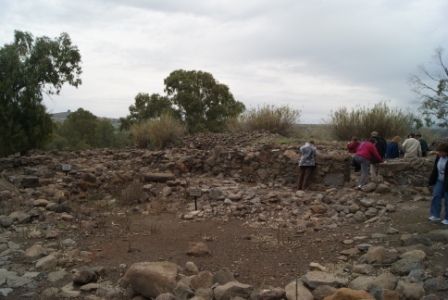 No synagogue has yet been discovered in Bethsaida, but much of the town remains buried under layers of rock and dirt. Symbol at the gate, warning people that the town is defended. 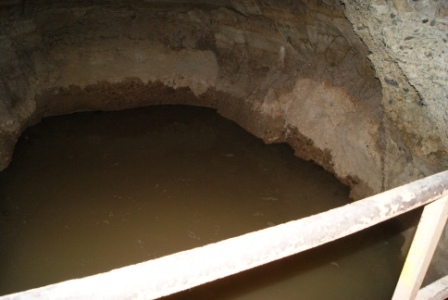 Below it is a stone manger, a watering/feeding trough for animals passing by on the Via Maris. My roommate Nina and I, and another colleague Myung. One of the best parts of the trip is making new friends with such wonderful fellow pastors. 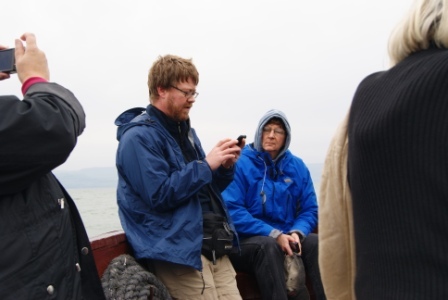 On the boat, we gathered to read the scriptures about Jesus calming the storm at sea and walking on the water. As I was listening, I followed my old habit, closing my eyes to imagine the story in my mind. After a few seconds, I realized: “Open your eyes! You’re here! Picture it happening right in front of you!” Being in the place where Jesus walked has taught me to imagine with my eyes open. 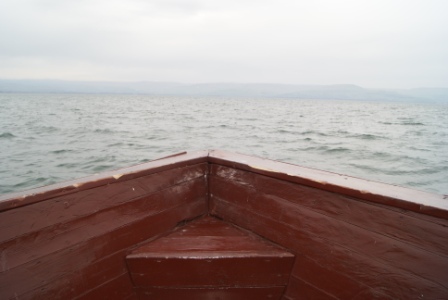 Today I pictured Jesus walking across the sea to us, or arguing with the town leaders at the city gate in Bethsaida. I have imagined him delivering the Sermon on the Mount, or dining at Peter’s house, or praying at the synagogue in Capernaum. But imagining with my eyes open is more than that—it is imagining Jesus’ story living on 2000 years later in those of us who follow him. I imagine with my eyes open when I see the connection between Jesus feeding the 5000 and our church feeding the hungry in our community. I imagine with my eyes open when I envision myself living out the ethics of the Sermon on the Mount in my life, and try to follow that vision. I imagine with my eyes open when I see the hardworking people fishing and farming today in the Galilee or back home in Indiana, and imagine how Jesus would connect his message of love to their stories and their labors. I hope, when I return home, I will not close my eyes, but will keep on imagining with my eyes open, and picture Jesus happening right there. 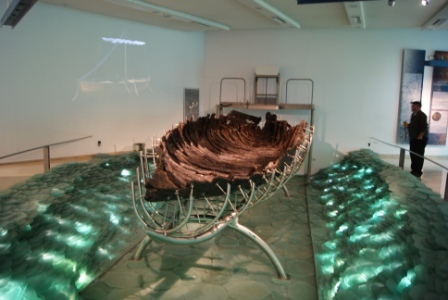 Connected to the boat docks, also on Kibbutz Ginosar, is a museum containing the only first-century boat ever discovered by archeologists. We heard the story of its preservation from the sea, and all that archeologists have learned from it. The boat itself is made of 12 different kinds of trees, showing how much it was patched and re-patched over the years of use. 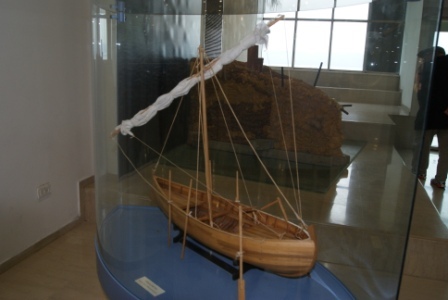 A model of what the boat probably looked like, based on art from the period. This site was our first exposure to the tacky aspects of the tourist trade here in the Holy Land, as we browsed the museum gift shop. (You can browse too at www.jesusboat.com.) I actually find cheesy tourist shops highly entertaining, and I found a treasure today. I did not buy it, but I did take a picture for all of you to enjoy. 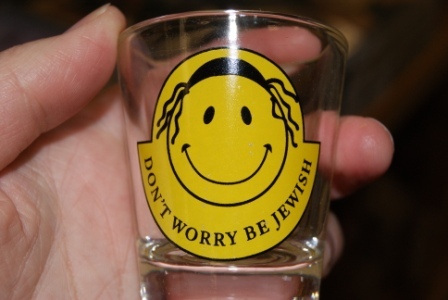 "Don't Worry, Be Jewish." On a shot glass. 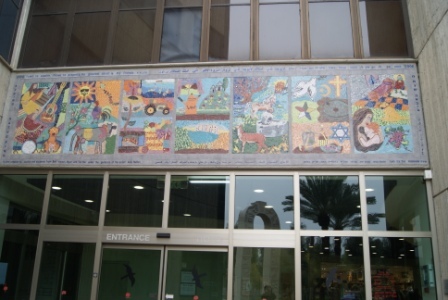 We saw some children’s art projects, organized by the kibbutz every summer to bring together Muslim, Jewish and Christian children in the region with art as the common language. Then, we adjourned to a local roadside stop (not a typical tour bus destination) for my first falafel since I’ve been here. 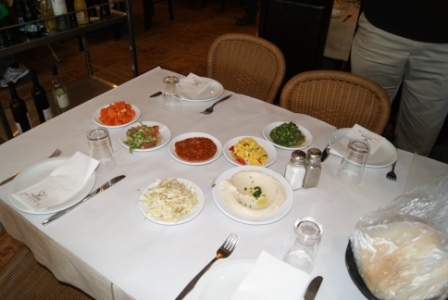 As a big fan of falafel, I was eager to eat it in Israel, and I was not disappointed. Yum! Mosaic at Kibbutz Ginosar, created by Muslim, Christian and Jewish children. 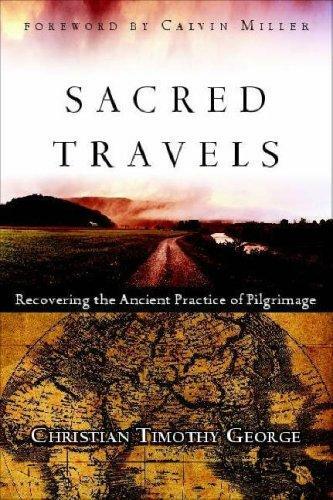 Sacred Travels: Recovering the Ancient Practices of Pilgrimage by Christian George, IVP Books, 2006, 179 pp. What a disappointment this book turned out to be! I ordered two books about pilgrimage to take with me on this journey, in hopes that they would center me in the tradition of sacred journey during my time in the Holy Land. This book started out great, and I thought it would nurture me well—in the end, the theology turned sour and the spirituality seemed shallow. Sacred Travels purported in its subtitle to be a guidebook to “recovering the ancient practice of pilgrimage.” The introduction and first chapter did just that, and quite well. This was a helpful way for me to think about pilgrimage as I approached my journey. This trip was a chance to seek God, to be reformed and graced on the way to being a better person and servant of Christ. The subsequent chapters on Wartburg Castle, Skellig Michael and Assisi were fine, but not particularly inspiring. After that, though, I recommend you just stop reading. The chapter on John Newton glosses quickly over his connection to the slave trade (from which he did subsequently repent) to focus on a storm at sea (while working on a slave ship). The chapter on Nagasaki focuses on 26 Christian martyrs in 1597. Even though he mentions the atomic bomb and a trip to Hiroshima, George devotes a large portion of that chapter to images of Christians as warriors, with the scripture as our sword. This shows a huge disrespect to the peace witness of Hiroshima and Nagasaki. I thought it couldn’t get any worse, but it did—the chapter on Taize was all about his unrepentant homophobia. I cannot recommend this book to you, because George’s theology reeks of a personalized gospel that ignores Jesus’ call to social justice. While there were some helpful tidbits here and there, please don’t buy it. Just check it out from the library, enjoy the first thirty pages or so, and send it back. Why did Christ take the ultimate plunge? I guffawed when I read that line, and at the thought that our “ultimate plunge” paralleled Christ’s journey from heaven to earth. My fellow “plungers” got a great laugh as well. Looking west at Capernaum and the Golan Heights from the top of the Mount of Beatitudes. Today was just as filled with God as yesterday was, but God treated me a little more gently, and with humor. Looking east toward Tiberias from the top of the Mount of Beatitudes. Our first stop this morning was at the Mount of Beatitudes, which is the semi-traditional site of the Sermon on the Mount. I say, “semi-traditional,” because the tradition does not go back even to the fifth century Byzantine church, but only to the last 100 years. Like Tabgha, it’s best to say that Jesus delivered the Sermon on the Mount on a hillside very much like this one, if not this very one. 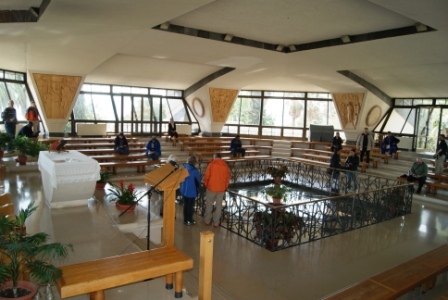 It was my turn to lead morning prayer, which took the shape of a Sunday morning communion service in a small, open altar area atop the Mount of Beatitudes, looking out over the whole of the Sea of Galilee. The leaders had already assigned a natural scripture: the Sermon on the Mount, and I knew that all I needed to do was create space to hear those familiar words, and then get out of the way. I divided up the long sermon into short pieces, and various members of the group took turns reading them, with pauses for silence in between each of the 12 sections. When we got to the part containing the Lord’s Prayer, we prayed it together. Afterwards, we sang a confession, shared the peace, served one another communion, and sang the Doxology. 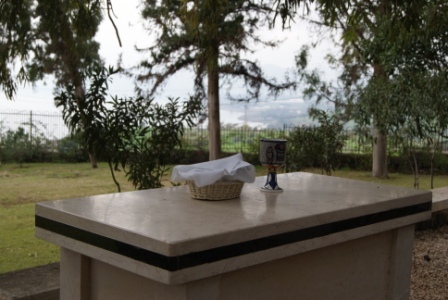 Our communion table on the Mount of Beatitudes. 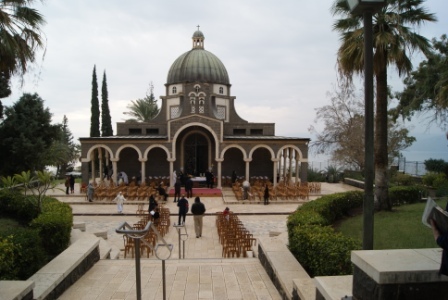 I felt much less of a connection to the world of Jesus’ day while I was up on the Mount of Beatitudes. The entire mountaintop is a well-sculpted campus for the Benedictine sisters, with a chapel, hostel and multiple outbuildings. In my mind, Jesus delivered the sermon on an untamed hillside, not a manicured one. However, the vistas were spectacular and the campus beautiful. They were preparing for a major mass in a few hours, for the Feast of Beatitudes. The nuns were busy setting up chairs and putting out bulletins, preparing for the Patriarch’s visit from Jordan. I felt a connection to all their hustle and bustle, recognizing the work we share in preparing for special occasions of worship in our communities. 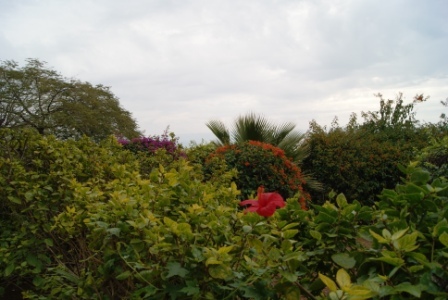 "Consider the lilies" as the flowers bloom atop the Mount of Beatitudes. Listening to the Sermon on the Mount in that place, in its entirety, gave me a better imagination about the images Jesus used to illustrate his message. 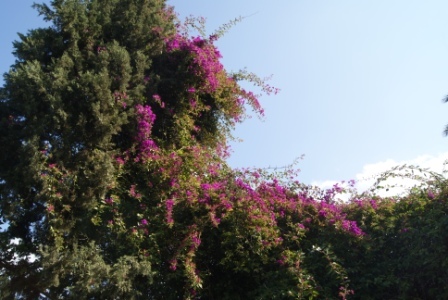 Anyone gathered on that mountainside, or any other in the area, has a view of the whole of the Galilee, its towns and roads and the Sea itself. 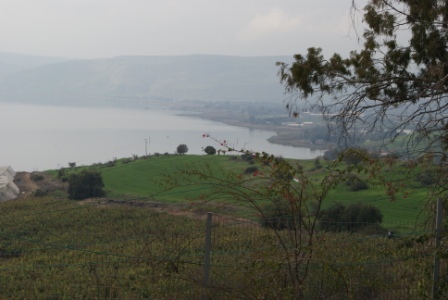 When he talked about a city on a hill that cannot be hid, you could look out and see Upper Tiberias to the south, and knew that Chorazim was on a hilltop behind you. 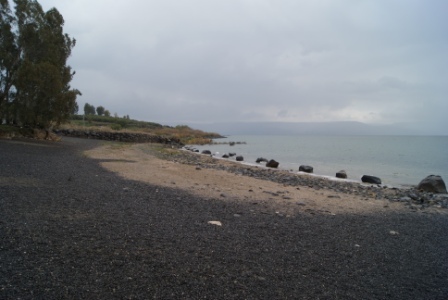 When he talked about rain falling on the righteous and the unrighteous, his audience could look out over the whole territory surrounding the Sea of Galilee, including the pagan city of Tiberius and the Samaritan towns considered unclean. When the reader got to the part about looking at the birds and how God cares for them, we heard the chirping in the trees above our heads. “Consider the lilies of the field” makes perfect sense when you are gazing out on a field of flowers in bloom. 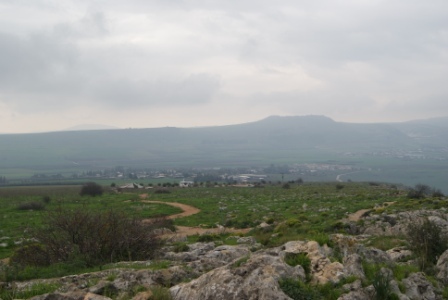 I cannot imagine ever reading or hearing the Sermon on the Mount again without imagining the Galilean landscape. 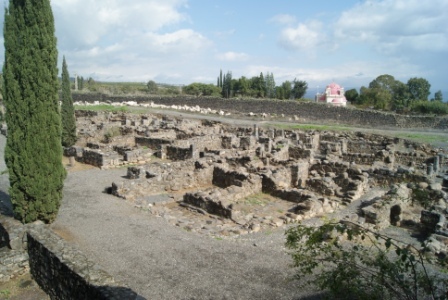 We then traveled a mile or two behind the Mount of Beatitudes, away from the sea, to the ruins of Chorazin. 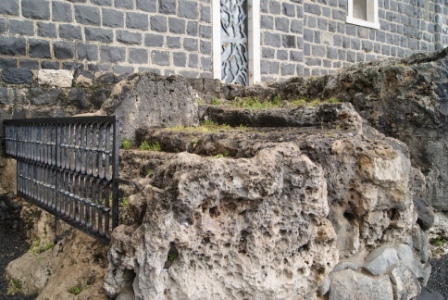 These ruins were made of black volcanic stone, like those in Capernaum, but we were free to wander among them and enter reconstructed homes and synagogues. Chorazin was not one of Jesus’ favorite cities—the only mention made of it in the Gospels comes when Jesus cursed the town in Matthew 11:21. 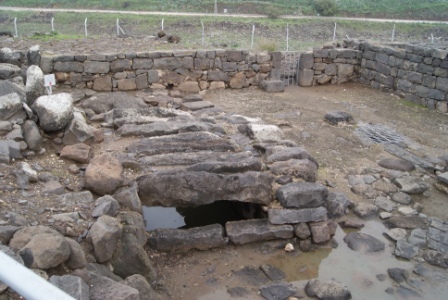 We saw another 5th century synagogue, but this time also saw a ritual bath. 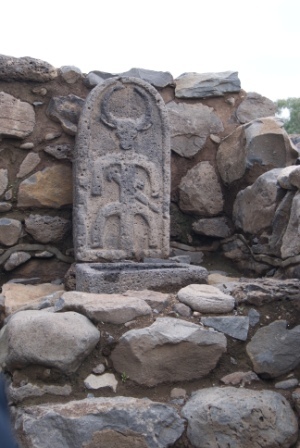 Chorazin was destroyed by earthquakes in the 4th century, but rebuilt and occupied until the 17th century. 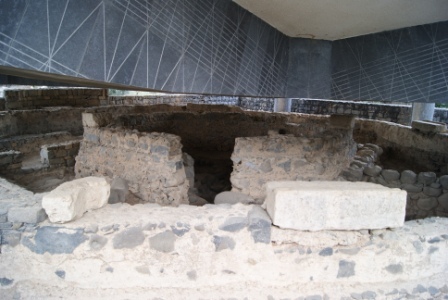 Inside a first-century home excavated and rebuilt in Chorazin. 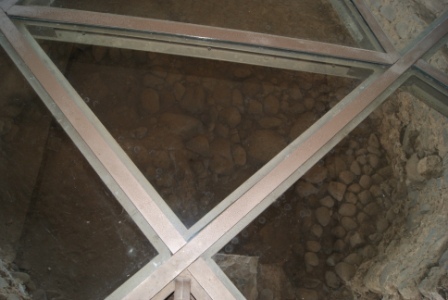 An ancient ritual bath, used before entering the synagogue. From Chorazin, we traveled down into the valley and back up again, through the modern city of Tiberias, making our way to the Cliff of Arbel. 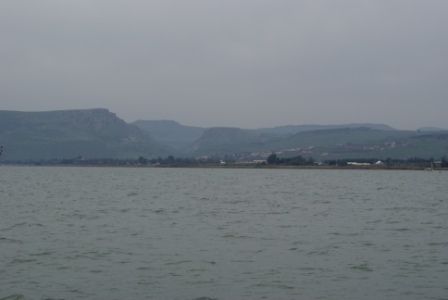 This cliff plays no particular role in Jesus’ story (that we know of), but it is an amazing view of the Galilee region. 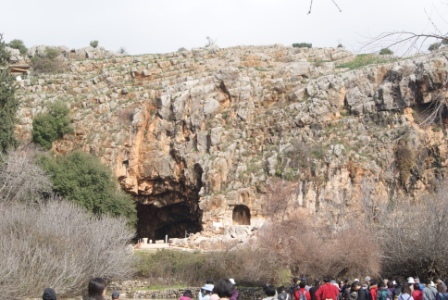 Along the sides of the cliff are a series of caves, which have been popular hideouts for rebels across the centuries, including the Zealots in Jesus’ day. We hiked over rocks and through mud puddles from the parking lot to the top of the cliff. 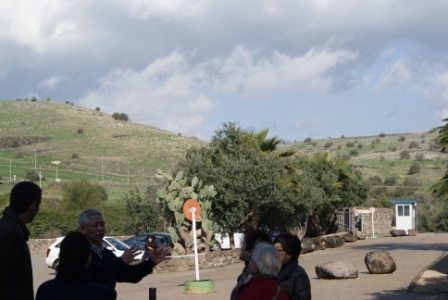 In spite of the overcast day, we could see for miles and miles—Mount Tabor (site of the Transfiguration), the Horns of Hittim (site of the defeat of the Crusaders by Saladin in 1187), Mount of the Beatitudes, Magdala, Tabgha, Capernaum, Tiberias and the Golan Heights. It was glorious, and these photos will never do it justice. 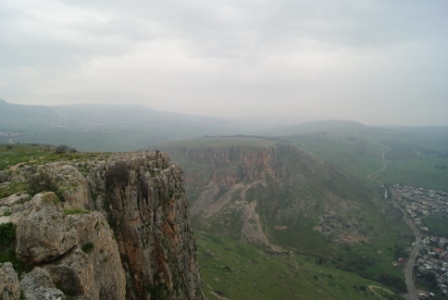 Looking east, away from the Sea of Galilee, from the Cliff of Arbel. On the right, the Horns of Hittim. 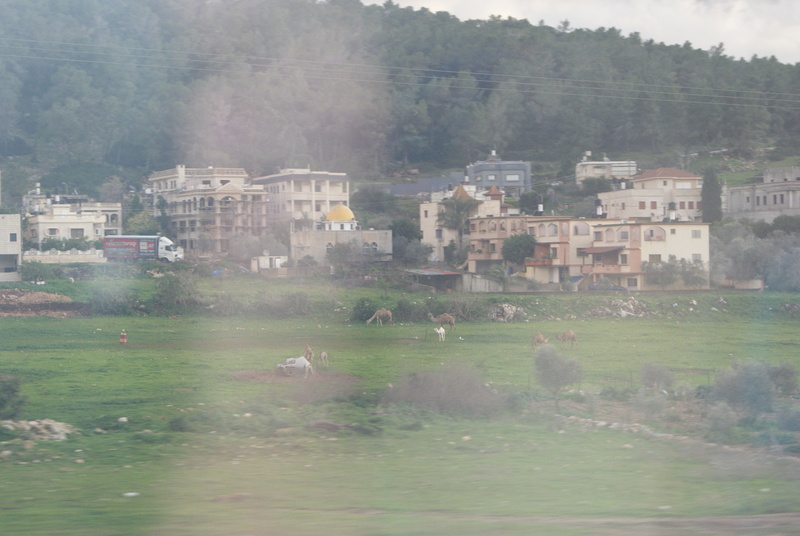 On the left (in the distance), Mount Tabor. 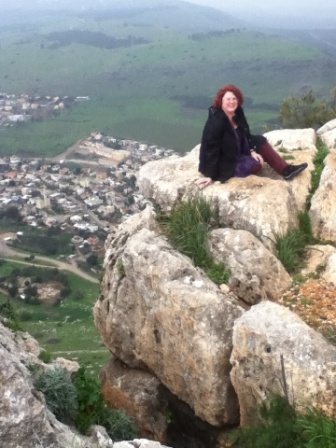 Me on the edge of the Cliff of Arbel. From the top of the cliff, we went all the way to the bottom of the valley—after a quick stop for lunch at a kebab shop in Tiberias. 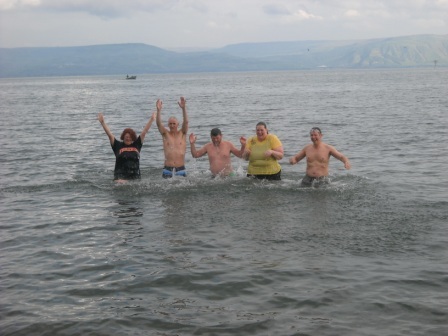 Several fellow pilgrims and I decided to take a “polar plunge” in the Sea of Galilee. 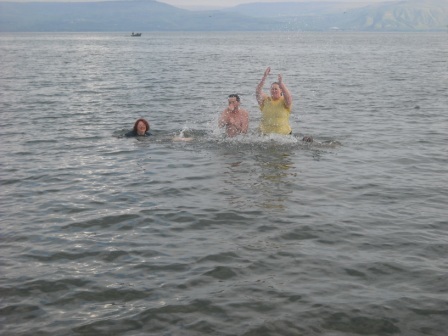 Although the air temperature was 60 degrees, and the water temperature a mere 54, we were determined to take a swim. 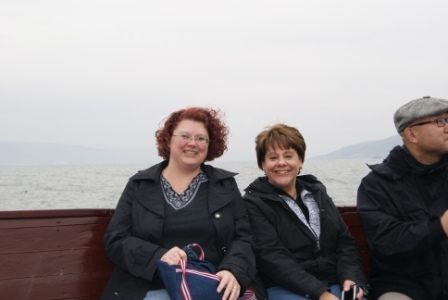 So, with much joy and laughter and a little bit of shrieking, we did! It was absolutely awesome. Water has always been a source of spiritual healing for me. Growing up near the ocean, I would make a pilgrimage to the ocean almost daily as soon as I could drive a car. Sitting on the shore, I can always find God’s voice in the sloshing waves. 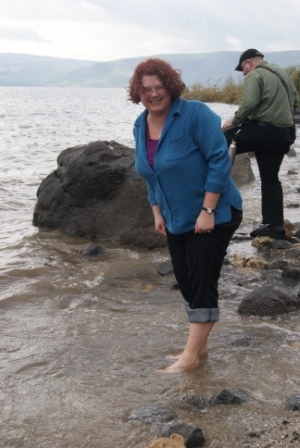 As soon as we got to the Sea of Galilee yesterday, I had to put my feet in it. When someone suggested a full immersion, I immediately agreed. It was cold enough to take my breath away, but I felt a sense of overwhelming joy and renewal being in that water. I laughed harder and more freely than I have in a long time. Once I got in, I didn’t want to get out, even as cold as it was. The water was liberating, piercing, cleansing, like baptism. Tonight during our evening reflections, our leader asked us for one word that spoke to our feelings and experiences of the day. One of my fellow “polar plunge” people replied, “breath-taking,” and we all broke out in uncontrollable giggles. We had enjoyed breath-taking views all morning, and an icy swim that took our breath away in the afternoon. As I laughed until tears rolled down, I shared that my word was “unfettered.” Running into that water today felt like washing away all the accumulated burdens of the world, and emerging unbound, open and ready for God anew. I may have spent the morning on the top of mountains, but my mountaintop experience came at the bottom of valley in the chilly Sea of Galilee. I can’t stop smiling when I think about it. Oh, and after we’d all come in, enjoyed hot showers and warm clothing, we learned that another member of our group had wanted to participate, but didn’t get word it was today. So, she asked if anyone would do it again tomorrow. Every single one of us said yes. We can’t wait to do it all over again! Still smiing, after the plunge. Ready to do it again tomorrow! The Pilgerhaus where we are staying. My room is in the far building. Today we began the pattern that will shape the remaining days of our journey: awake, morning prayer, breakfast, excursion to holy sites, lunch, afternoon of quiet time, evening reflection, evening prayer, dinner, and more quiet time in the evening. The other side of the Pilgerhaus, where the lobby and dining area are located. As we gathered for morning prayer this first day, still bleary-eyed from our long journey, I was noticing everyone’s shoes. Looking around the circle, it was clear that many people, like me, had bought new, sturdy walking shoes for the occasion. These clean, pristine, shiny shoes spoke of our eagerness and newness as pilgrims. How long, I wondered, before we get muddy? When we leave, will our shoes look worn and aged? Will they lose their shine and return home instead like familiar friends, comfortable and well-traveled? And will that be true of us as well­—will our travels turn our eager excitement about Israel into familiarity and groundedness? Will we return home muddy, but wise? We sang “This is the day that the Lord has made!” and prepared to receive the gifts of this day. 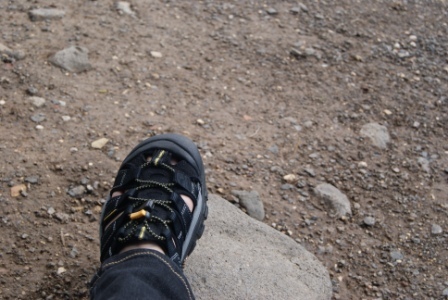 My new shoe, on a Galilean rock. The shoes were quickly put to the test. 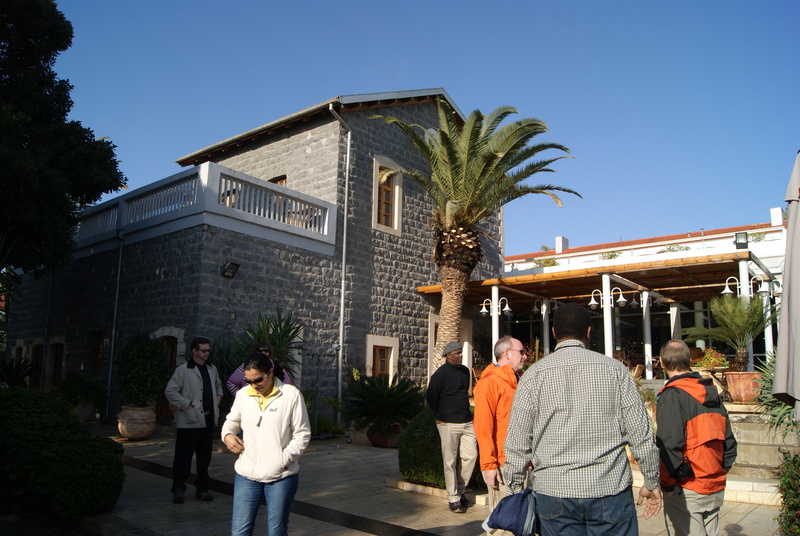 We walked to our first destination, Tabgha, the Church of the Multiplication of Loaves and Fishes. 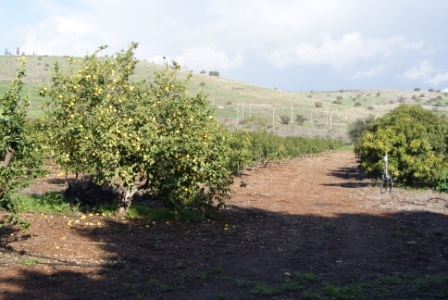 It was a short and easy walk through groves of lemon, mango and olive trees, but the path was shared with animals. I doubt anyone’s shoes escaped the manure littering the path. 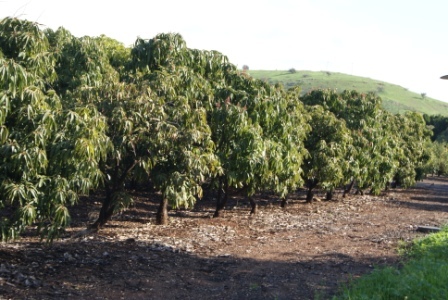 Mango trees on our path to the left. Lemon trees on our path to the right. Tabgha is one of the “traditional” holy sites in Israel, which means that there is no historic record that the actual feeding of the 5000 took place on this exact hill, although we do know that it was somewhere very close. When Constantine conquered and Christianized the land in the 4th century, he and his mother built churches everywhere they deemed a holy site. 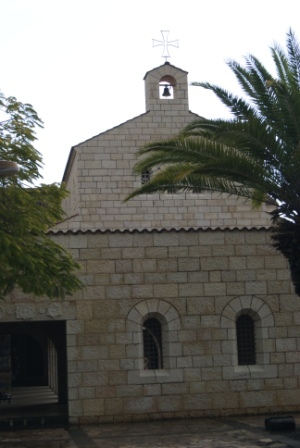 Tabgha is the site of a Byzantine church from the 5th century that commemorates the story of the loaves and fishes. 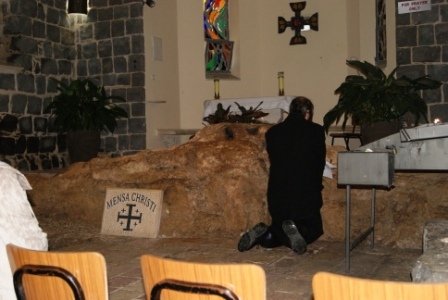 There is even a rock that the church was built around, which they hold was the spot Jesus used to break the bread and distribute it to the crowd on the hillside. 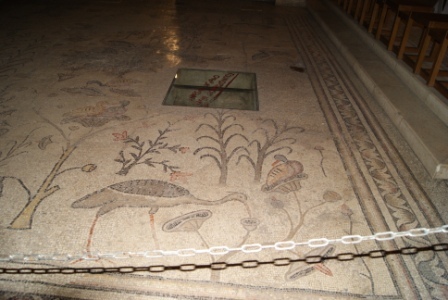 The legendary rock, with the famous loaves and fishes mosaic in front of it. Whether this is fact or fiction does not matter. If it was not this hill, it was one just like it, right in this region. If it was not this rock, it was one very similar. 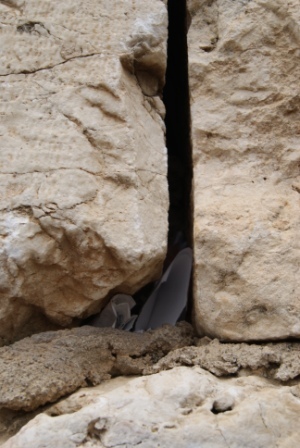 The site is made sacred by the thousands of pilgrims that have come before, and by the way it enshrines a particular episode of Jesus’ ministry for us to remember in a physical place. 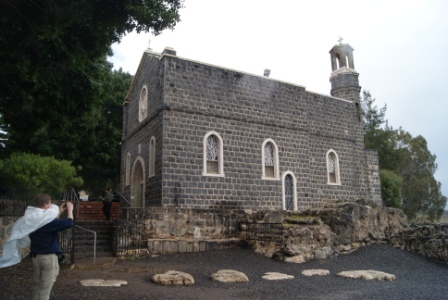 The German Benedictines have ownership of the site, but they were not allowed to build a church upon it until after the British Mandate in 1917. When they finally began to build, they discovered the original mosaic floor of the Byzantine church intact under the surface. 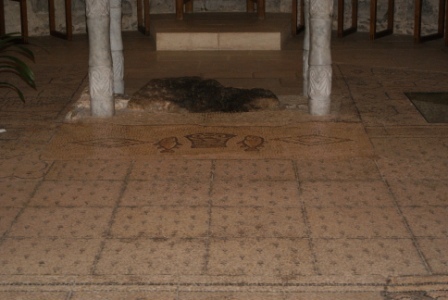 The floor was preserved, and I was especially eager to see it. 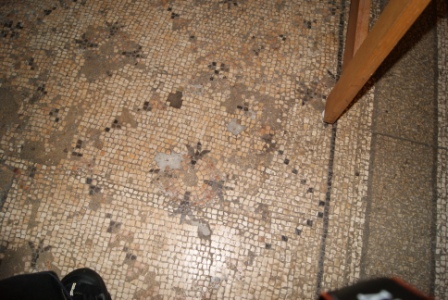 When we entered the church, I was astonished to see that the original mosaic floor, 1500 year old, was still the floor of the church, and we could walk right on it, touch it, and see it up close. Especially artistic sections were roped off, and much of the floor had to be repaired. However, they repaired it in black and white, so you can see the difference from the original colored Byzantine tiles. I sat in a chair in the chapel and simply ran my fingers over the pink and white tiles, placed by there by a Christian artist so many years ago. A beautiful mosaic of birds and animals. 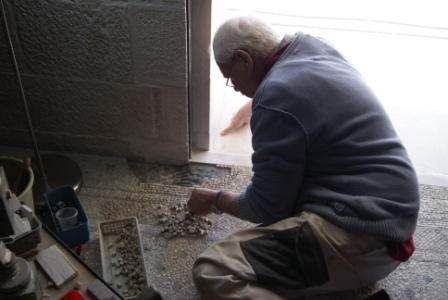 An artist at work repairing the tiles. Tabgha was the most moving experience for me today, but not for any reason I expected. I was moved not by what happened so long ago, but by the way Jesus’ meal is recreated over and over again all the time. 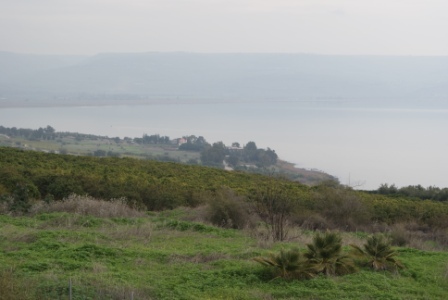 Jesus stood on that hill, or one like it, surrounded by the beauty of the Galilee, and preached. Then he broke bread and passed it around, so that everyone who was hungry could be fed. Such a simple act, yet so profound. As I sat in the chapel, I thought about the church I serve, which offers a community meal every Saturday for anyone who is in need. We call that meal “Loaves and Fishes,” and imagine ourselves every week recreating Jesus’ miracle. I prayed for that ministry and its leaders, and all the people we serve. I know our church is not alone—all across the world, churches feed people in Jesus’ name, performing the same miracle over and over and over again. Could Jesus have imagined, when he did something as simple as feed a hungry crowd, that his ministry would be alive and thriving, feeding hungry people two thousand years later? My vision expanded to include every sacred meal I have shared. I remembered special times of holy communion, breaking bread at Shabbat in the home of a friend, picnics and church suppers, restaurant meals and family holidays. 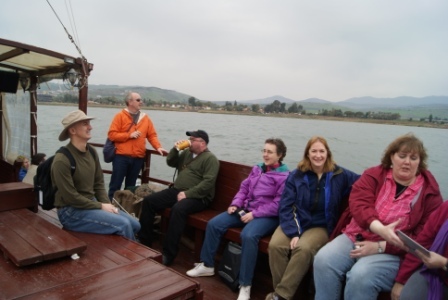 Any time a meal is shared, any time we pause say grace, any time we offer food to our neighbor, we are participating in the same story of Jesus that began right here, on an ordinary hill, an ordinary rock overlooking the Galilee. My heart was so full of memories—corporate memories of Jesus and the church, and personal memories of breaking bread with friends, of eating and sharing and being filled. Thanks be to God. Our lunch at the Tanureen restaurant, where we broke bread together. 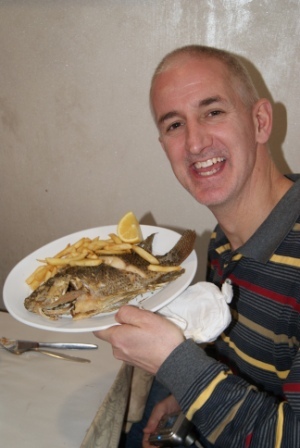 Tom and his St. Peter's Fish, a whole fish, supposedly in the style of the 1st century, fried up just like Jesus would have. Maybe. 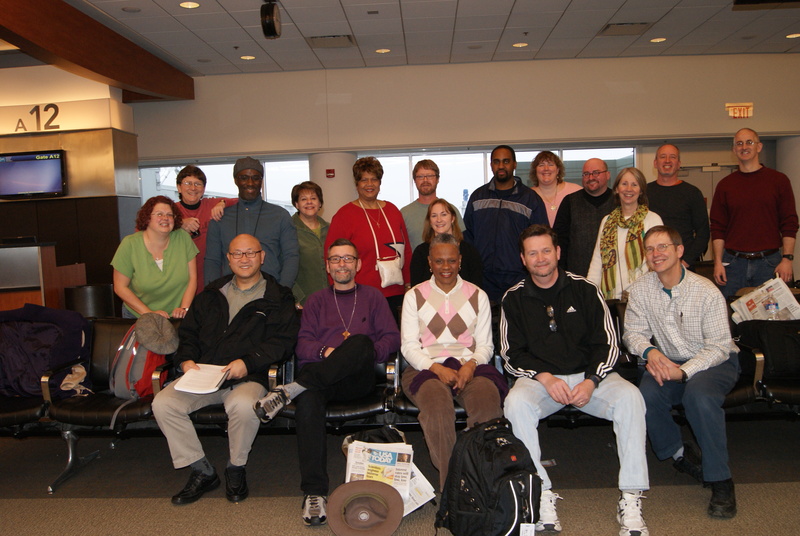 Most of our Macedonian Ministries group at the Louisville airport. We have arrived! We travelled from Louisville to Newark, then from Newark to Tel Aviv. At the airport in Tel Aviv, our tour bus picked us up for a two-hour bus ride to the Sea of Galilee. From home to hotel, my travel time was exactly 25 hours, and we crossed seven time zones. 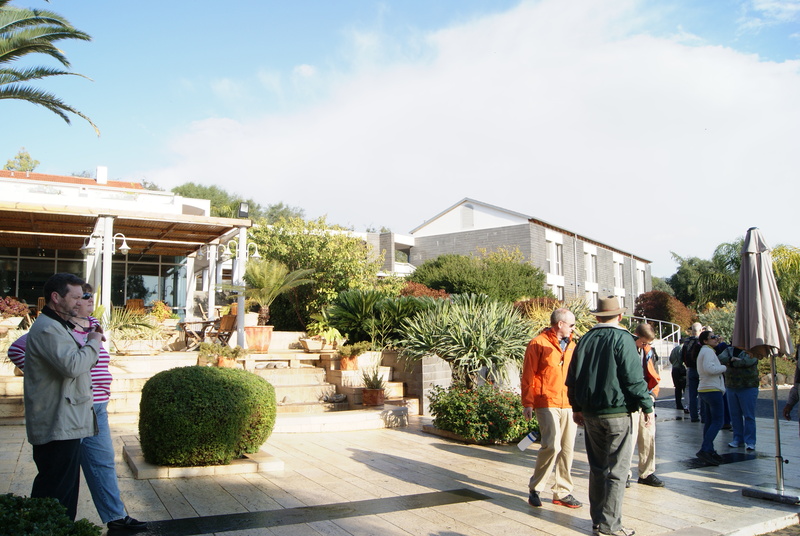 We are staying at the Pilgerhaus, which is on the northeast side of the Sea of Galilee, just yards from the shore and north of the city of Tiberias. We arrived after dark, so I have not yet seen the view. Apartment buildings on hillside. These kind of apartment buildings are everywhere, especially in cities and Jewish territories. They were built to house all the immigrants arriving to Israel from around the world. Traveling, for me, is both terrible and terrific. Airplane seats are tiny and cramped, the food was awful, and I slept less than an hour on the 11-hour overnight flight. My body is stiff, sore and exhausted. And yet, I watched three movies in a row, read books galore, and had lots of time to simply sit back and think and pray myself into pilgrimage. Hours in transit offer a liminality that helps disconnect me from ordinary life at home and enter into a different mode of being. In airports and airplanes, you are in a time out of time, no longer certain of the date or even whether it is day or night—yet somehow, when you arrive, after a good night’s sleep you are refreshed and ready to begin anew. 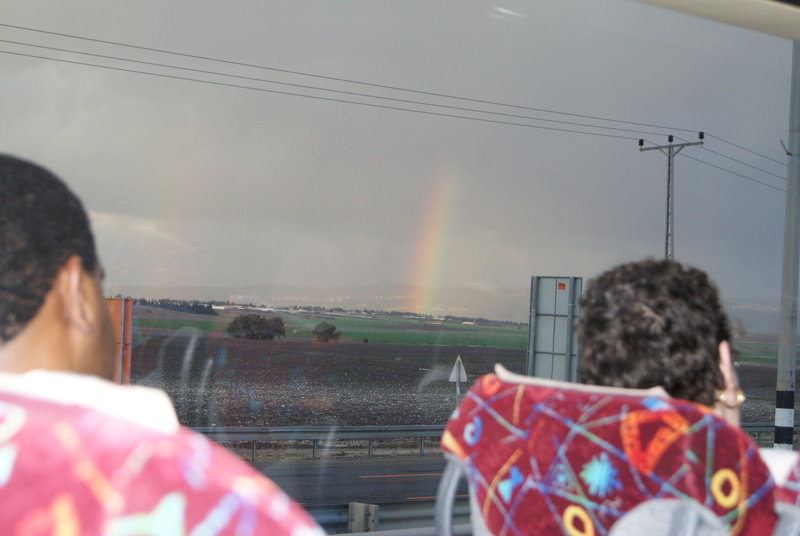 Preparing my heart for pilgrimage made me appreciate the sight of a beautiful rainbow as a true gift from God. I also have my Bible, a notebook, and a travel guide prepared by the Macedonian Ministries Program, unique to this trip and the sites we will explore. On the plane, I read the first several chapters of both books about pilgrimage. Both spoke to me deeply about the sacred longing that pulls us into a pilgrimage. They also reminded me of the hardships and struggles of earlier generations of pilgrims of all faiths, who traveled on foot for years, faced disease and starvation, and death along the way. Twenty-five hours on a plane is a small price to pay, and physical discomfort is part of the process. 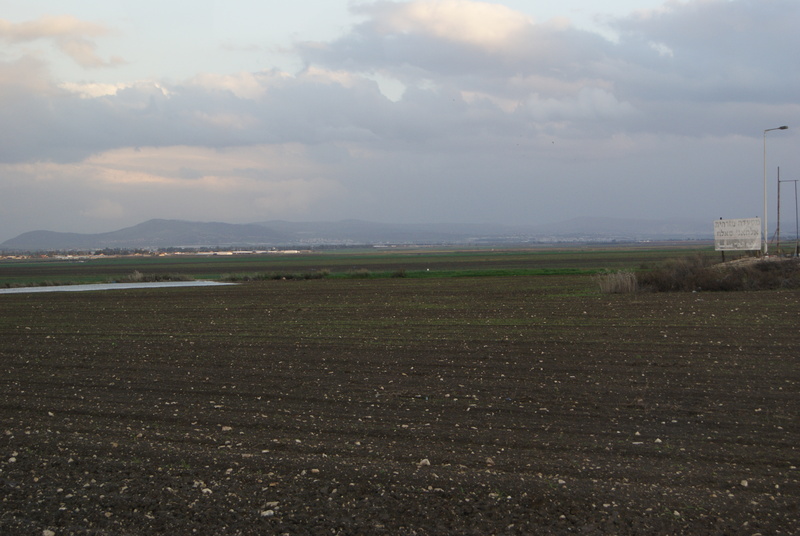 View of the Jezreel Valley toward the north. This actually does look a bit more like the land of milk and honey, but the surrounding hillsides do not. It was raining for part of our journey, and I watched the muddy water running off the hills without soaking the soil, channeled instead into gulleys and pathways. I imagined it rushing away to a safe location, where it would wait and return to the land again through the irrigation system that will make food for the people all year. Water makes life in the desert. Living water. Can you find the guy on horseback in the parking lot? One of the things that surprised me was the abundance of animals I saw on our short journey. Before we had even made it far from the airport, I looked out the window to see a flock of sheep and goats wandering through a green valley. I didn’t see a shepherd in sight, but it was as if every scripture of sheep in the Galilee, from Psalm 23 to Jesus’ parables, had all come to pass before my eyes. I confess: it was such a stereotype that, rather than a sense of awe, it just made me giggle. Besides the sheep, we saw a man riding a horse through a parking lot, and a field full of camels dancing and prancing around, including a baby one that was all white. Not a great picture, because it was through the bus window, moving fast. But look, frolicking camels! Even a baby all-white one! Already, the overlapping of the distant, mythical past and the modern, urban life of Israel are ever-present in my experience. I saw sheep and camels, biblical places like Nazareth, Mt. Carmel and Mt. Tabor, but I also saw the Security Wall closing off the Palestinian territories. 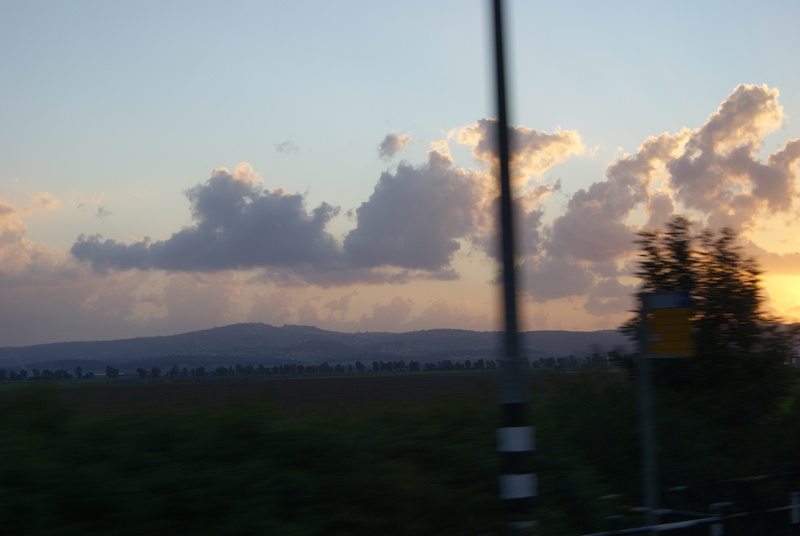 I saw Jewish settlements, and kids playing soccer, and families walking to Shabbat services at sunset. We got stuck in traffic due to a six-car pile-up, and watched the ambulances try to get through. 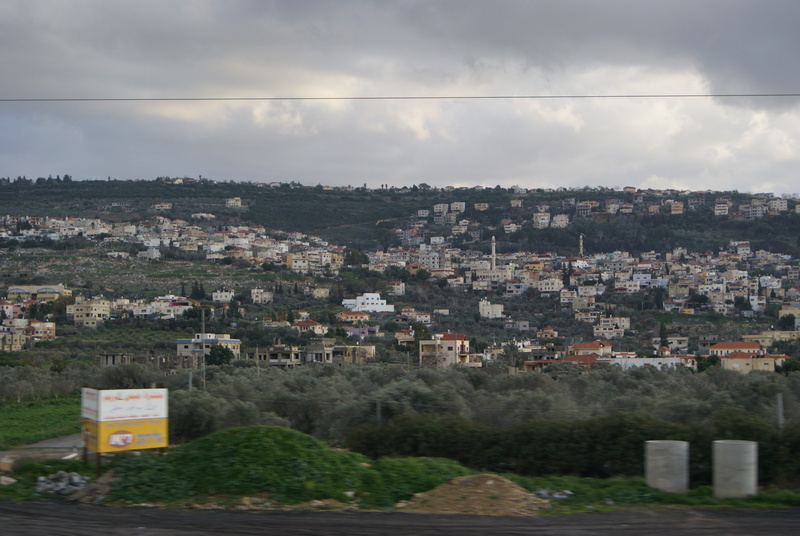 We drove along the edge of the West Bank and saw the battling Palestinian and Jewish architecture in local villages. This clash between past and present, the simultaneous presence of mythical places and all-too-real ones will, I expect, continue to shape my understandings and experiences here. 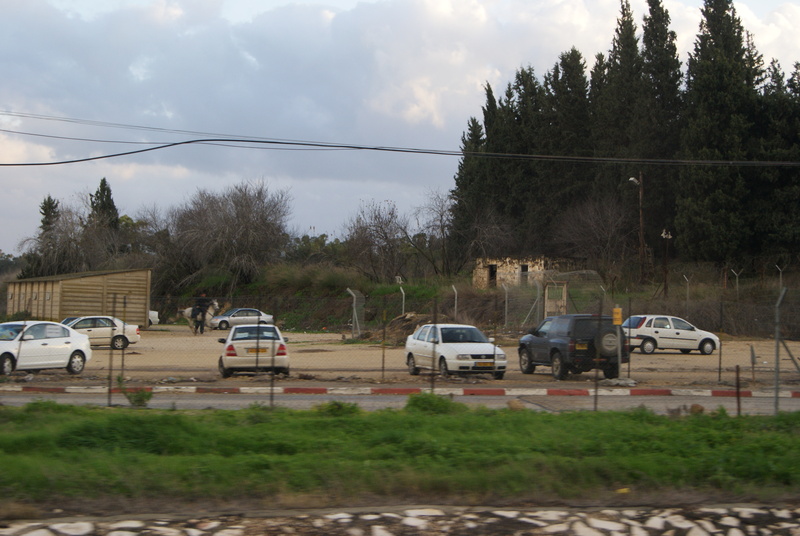 A Palestinian village in the West Bank, with Jewish settlements. Our tour guide Claudia explained that the flat-roofed houses are Palestinian or Arab, because they always plan to expand and add another level for each new generation. The red roofed houses are Jewish, because they build in a more Western style single-family home. 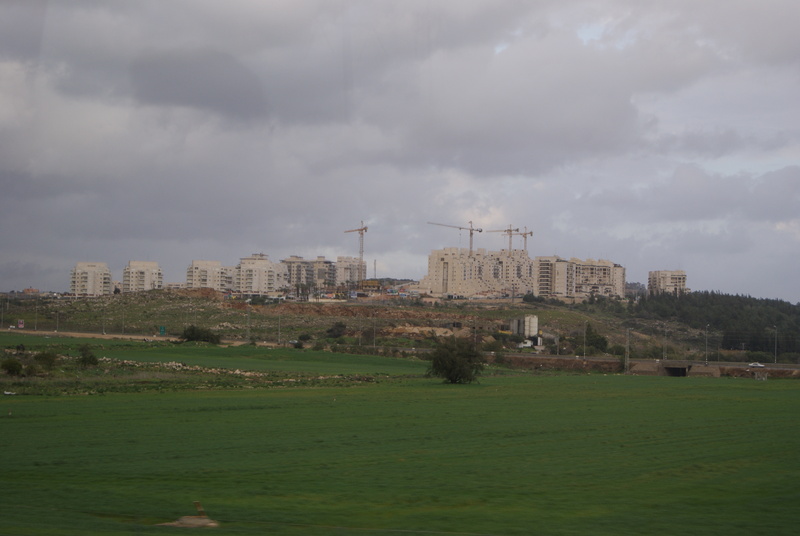 You could then see, as we drove along parallel to the West Bank territory, the Palestinian villages with their minarets, and the Jewish homes built right next to them. The journey has only just begun. The day has been long and arduous, but this is as it should be. Now, to rest.